Premium Boat Care is now part of the Autogeek Family! Home > Premium Boat Care is now part of the Autogeek Family! We're excited to announce that PremiumBoatCare.com is now part of the Autogeek family! Autogeek is the new home of Premium Boat Care! Now instead of going website to website looking for the best deal/product/shipping price, everything can be found right here at Autogeek! All of your favorite products from Premium Boat Care are here and ready to ship – simply pick an option below and get started! As a welcome to Autogeek, we would like to offer you your choice of either 15% off by using coupon code WPBC15 or receive FREE shipping when you use coupon code WPBCFS when you place your first order. Both coupon codes will activate once you sign up for our newsletter below. 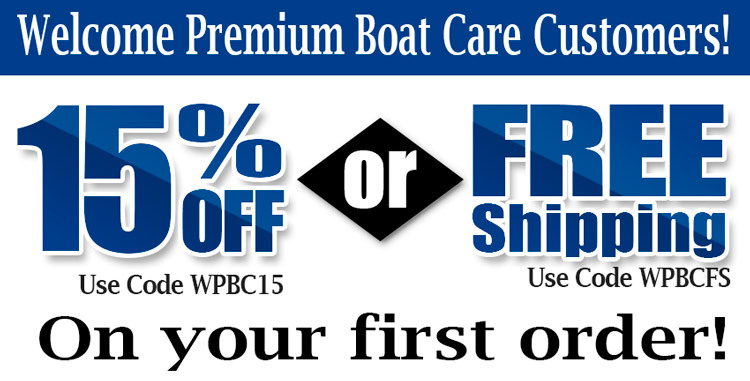 *15% Off Coupon Code WPBC15 valid on in stock items. Not applicable on previously placed orders, custom or special order items, extractors, air compressors, BUY ONE GET ONE, VIP Special, car covers, polishers & polisher kits, vacuums, Kreepstool, FlatStoppers, garage flooring, gift certificates, bulk and case pricing, complete wash systems, Jay Lenos Garage Advanced Vehicle Care Products, or any item as noted on product page. One coupon code per order. *FREE ground shipping on orders shipping within the 48 contiguous states. Applies to in stock items only. Regular charges apply for expedited shipping services. Sign up to the Autogeek/PBMG newsletter for special offers, sales, and the latest news in car care. Newsletter subscribers regularly receive newsletter-only coupon codes. Get "in the know" with the Autogeek newsletter! Sign Up To Autogeek's Free Newsletter! Sign up to Autogeek's VIP Club receive exclusive, unadvertised specials every week! Each VIP item is available for one week. Sign Up Today For Autogeek's VIP Club! *This is a separate mailing list from Autogeek's regular newsletter.